Here’s another reason to love Dallas Love Field Airport: free weekday concerts from 11 a.m. until 2 p.m. The airport is working with the Texas Music Project, which is organizing the Texas Singer/Songwriter Series. Jon Christopher Davis (pictured here) kicked off the series and will back again this Friday. See the current schedule here. And, while you’re at the airport, be sure to check out the permanent artwork collection and the temporary exhibitions the Love Field Art Program puts together. 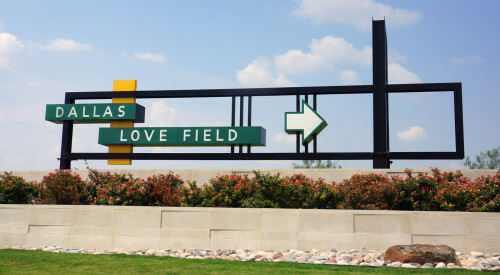 A first-day of issue ceremony for the 2016 Forever Love Stamp is taking place today at, appropriately enough – Dallas Love Field Airport. This Forever stamp heart design was created by artist Yulia Brodskaya, who made the heart using the ancient art of quilling – also called paper filigree— which involves rolling and shaping narrow strips of paper, laying them on their edges, and gluing them in place to form intricate designs. Michaels craft stores has put up giant coloring book page of the city skyline at Dallas Love Field Airport. 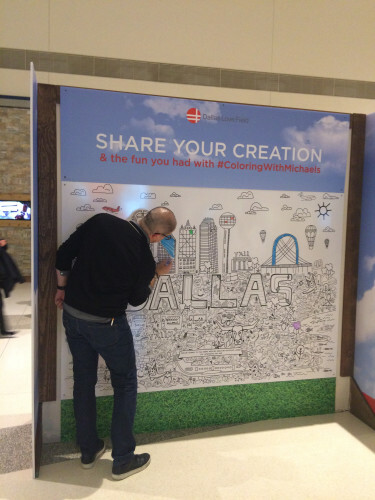 The wall will be up through the holidays and into the New Year and colorers are encouraged to use the hastag #ColoringwithMichaels to share images of how well they can color in, beyond or between the lines. What happens when the picture is all colored in? They just wipe it clean and start over. You may not be able to use it to see Pluto – just yet – but an OmniGlobe now on loan to Dallas Love Field airport will let you tune in more than 180 different interactive spherical displays depicting everything from the planets to the Earth’s wind current patterns, the land mass movement from 600 million years ago and the image of a Death Star from Star Wars. Science museums and universities sometimes have OmniGlobes on site, but this is the first time that one of these globes has been placed in an airport. The exhibition will be up through October in the Art/Travelers Art Gallery located post-security at Dallas Love Field.